The Wizard of Oz has invented an Ozoplane to go Strato-sphering! Oh, there's some pretty high sky-riding in this adventure, I can tell you! And with Dot, Jellia Jam, Cowardly Lion and Tin Woodman along, you can imagine the thrills and excitement. Return to wonder and magic of Oz in The Land of Oz the sequel to the Wonderful Wizard of Oz. Race through the countryside with Tip and Jack Pumpkinhead as they flee the wicked witch Mobi meeting many of your favorite Oz characters on the way. In this adventure, Dorothy gets caught in a California earthquake with her cousin Zeb, and they have many adventures underground with none other than the Wizard of Oz! But can they find their way back to the surface world? Forced out of their forest, two Oz characters embark on the search for magic ingredients which will change their lives, and encounter a spirited Patchwork Girl who travels in order to see the world. Fine vintage illustrations throughout a story. Ozma, the beloved ruler of Oz, has disappeared, so Dorothy, the Wizard, the Cowardly Lion, and a band of loyal chums must search the vast fairyland of Oz. A suspenseful story of adventure, humor, and magic, this tale will enthrall young readers. In this OZ adventure Scarecrow goes off in search of his past. 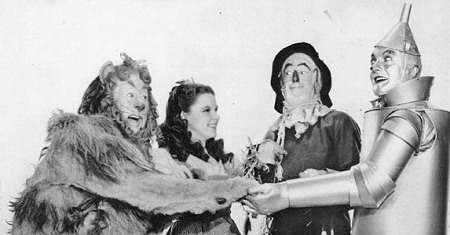 Dorothy and the Cowardly Lion search for him, eventually meeting with a knight, Sir Hokus, and the Comfortable Camel. Scarecrow discovers that, in a previous incarnation, he was human! The first American fairy and the classic of children's literature. Baum created wonders out of familiar items as a mechanical woodman, a cornfield scarecrow, and a humbug wizard. The tale has stirred the imagination of young readers for four generations.